MANILA, Philippines (Updated 11:20 a.m.) — The Japanese government vowed to help the Philippines provide assistance to the victims of the tropical storm Vinta (international name: Tenbin) and the Davao City mall fire. Japanese Prime Minister Shinzo Abe made the pledge Monday in his message of condolences to President Rodrigo Duterte. “Japan stands with the Philippines in overcoming this time of difficulties. Japan is ready to provide assistance needed by your country including provision of emergency relief goods to the maximum extent possible and sincerely pray that the affected areas will recover as quickly as possible,” Abe said in a statement. Abe offered his condolences to those affected by typhoon Vinta, as well as those who died in the fire that gutted the New City Commercial Center mall fire in Davao City. “I am deeply saddened and worried to learn the news that many precious lives were lost and serious damages were brought, including collapsed houses, forcing many people to evacuate, in your home region of Mindanao and other parts of the Philippines due to the recent typhoon,” he said. The death toll from Vinta has climbed to 240 after the tropical storm triggered landslides and flash floods that ravaged towns in Mindanao. A total of 70,000 have been displaced or affected by the storm, according to the International Federation of Red Cross and Red Crescent Societies. Rescue workers at NCCC Mall in Davao City have recovered the remains of at least 37 people by Monday afternoon. Authorities found them huddled together near a fourth floor stairwell. All those who died were BPO employees of Research Now and Survey Sampling International. 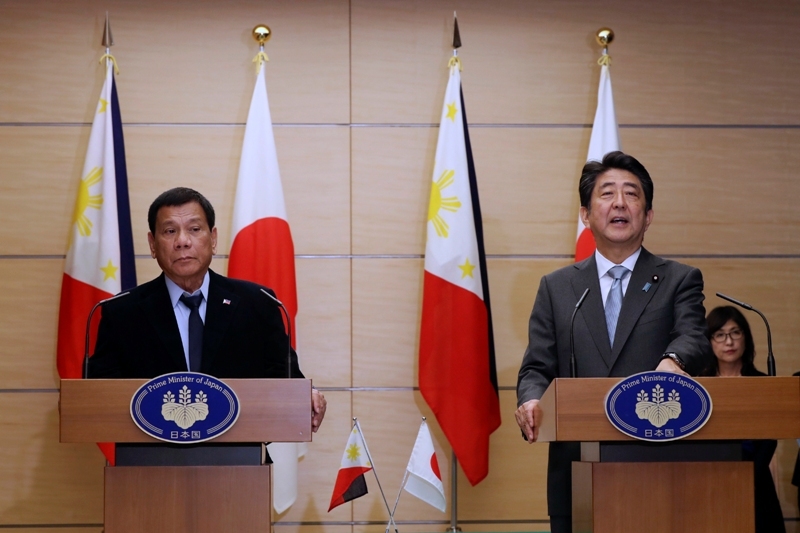 The Japanese government earlier pledged to provide assistance to the Marawi rehabilitation and for the first phase of the Metro Manila Subway Project. China, meanwhile, sent its sympathies to the Philippines over the losses brought by "Vinta". According to a release from the Chinese Embassy in the Philippines, Chinese Foreign Minister Wang Yi extended his nation's sympathy through a message to Foreign Affairs Secretary Alan Peter Cayetano. "I would like to hereby extend my heartfelt sympathy to Your Honorable (Cayetano) on the tragic disaster," the embassy quotes Wang as saying. "I am convinced that, under the leadership of the Philippine government, the people of the affected areas are bound to overcome the disaster and restore their normal livelihoods at an earliest date," he also said.